This week I had the last of my NCT refresher courses. I think I'm prepped and ready to go. I also stepped down from my primary role at work. It felt very weird at first not to be bossing people about and having to rush in and out of meetings but I can tell you this... it felt good. I've been able to relax a little bit and can feel the stress starting to melt away. The sunshine has helped with the stress relief too which is handy because Mr. B. has been working in London which means I've been doing the nursery run to and from each day without him to help and having to cook (oh, ok... order takeaway) and clean which we normally share equally. It was especially hard on Tuesday when I could barely walk because of pelvic pain and general baby uncomfy-ness. The pevlic discomfort I'm assuming comes from the fact that baby has dropped a lot over the week and, according to the GP, is now 1/5th engaged. I think I know the moment it dropped too! On Monday night I woke up at 1am in agonising pain near my pelvis - just as bad as I remember from labour. I could feel a light tightening in my uterus which happened twice within half an hour and I genuinely thought labour was starting. I practiced some of my breathing exercises to calm down, took some paracetemol and eventually managed to fall asleep again only to wake up when Mr. B. left at 6.30 feeling pretty normal again. On Tuesday I was really achey breaky all day. Thankfully nothing more sinister has happened since. On Thursday I had my 36 week check with the GP and took Lara with me. Because I work full time, I usually just pop out of work for my appointments, which means Lara is normally at nursery but today's appointment just happened to fall on a morning when we would normally be at swimming - we are currently on an easter break from swimming so Lara kept me company. She was so well behaved and seemed REALLY intruiged when the doctor took my blood pressure and again when he listened to baby's heart rate. I'm so glad I managed to share one of these experiences with her. Strange question I know but, have you ever hidden a favourite item of clothing from your child? This week I found myself having to hide Lara's single most popular piece of clothing because she simply won't fit into it any more but every time I put it to one side, Lara seems to find it again. 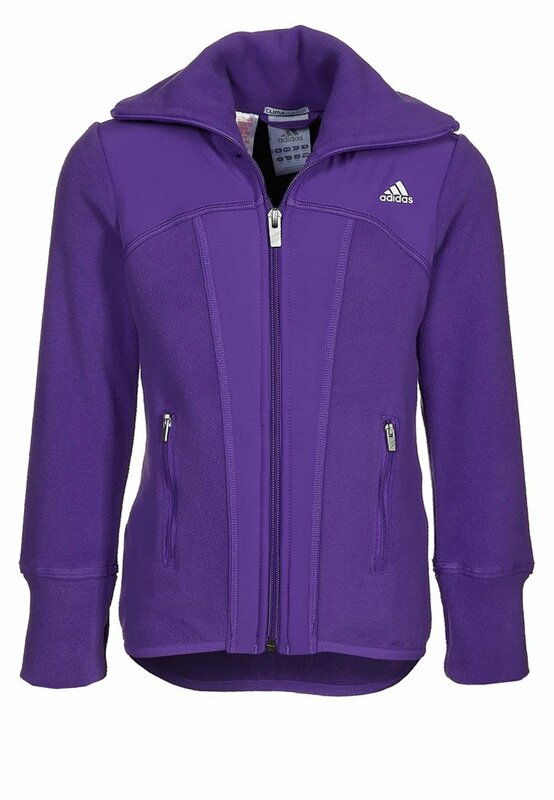 The clothing in question is a purple knitted zip-up hooded cardigan that Lara was given as a gift for Christmas 2010. I believe it was bought at a Christmas market somewhere in Europe and we fell in love with it the minute that Lara unwrapped it. Snuggly and practical, the cardigan came with us through all weather to all destinations last year. Because it is knitted, Lara's cardigan was a perfect item of clothing for wearing in the car when it was a bit chilly (a great big coat is a bad idea in the car because it compacts in the event of impact which means the seatbelt it too loose to offer protection). The best thing about Lara's purple cardigan was the reaction it got from other people - I wish I had a pound for every person (of any age) who had stopped us in the street to ask where it came from. Ever since Christmas 2011 I had been trying to stop Lara using the cardigan. The sleeves now come up to her elbows and if she attempts to wear the hood, she folds double and looks like a gnome because it really is too short. After several failed attempts to put the cardigan out of sight, I eventually had to shove it in a box out of her reach (it'll go in the loft at the next opportunity). And so now I was presented with the challenge of finding a replacement... quite how do you follow up a piece of clothing that was loved this much? After last month's review for Zalando they sent me a £40 voucher which I decided really had to be spent on finding THE replacement for the revered purple cardigan. 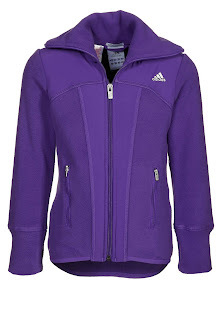 I showed Mr. B a selection from the kids clothing section and we agreed on this scrumptious adidas fleece despite Mr. B. worrying a little that it was too grown up for her. 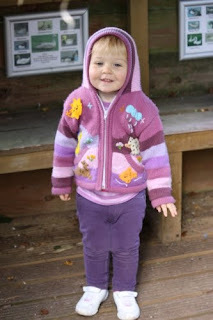 When the new and improved purple cardigan arrived it was an instant hit. It is so TOTALLY Lara I can't quite get over it every time I see her wear it. In it's first week, Lara wore it to nursery every single day! And so here is Lara in her NEW purple cardigan enjoying her Balance Bike . OK, so the cardigan really isn't the same style at all but they serve exactly the same purpose and Lara has fallen in love with this one - she is just as inseparable from this as she was from her knitted cardigan this time last month. Let's hope we get as much use out of this one too. Lara and I have been baking in preparation for Easter weekend. I've never made Hot Cross Buns before in my life but I seem to remember my Mum finding them quite tricky to get right. I guess that most people's expectations of a Hot Cross Bun are shaped by the soft, flat things you see in supermarkets - these a definitely not soft or flat! Baking is a good way to get children involved in the story of Easter - Lara seemed genuinely interested when I explained the origin of the cross on the bun. I adapted this recipe for volume and ingredients (I'm not a great fan of mixed peel) from a Mary Berry classic recipe. Make some shortcrust pastry by rubbing together the cold butter and plain flour with your fingertips and then combining the small amount of caster sugar and just enough water to bring the ingredients together in a dough. Chill this in the fridge until much later. Sift (or if you're Lara, just plonk) the bread flour, sugar, yeast, salt, mixed spice, cinnamon and nutmeg into a big mixing bowl. Make a little well in the middle and add the milk and water then mix together. Add the egg and the mixed fruit and bring together to a very soft dough. Knead the dough on a well-floured surface for at least 5 minutes (Lara lost interest after 2!). It should be really soft and stretchy by the time that you're done. Then leave it in an oiled mixing bowl with a piece of oiled cling film or a tea towel over the top in a nice warm place to rise for about 1.5 hours until it has doubled in size. When you take the dough out from it's cosy hiding place, you will need to 'knock it back' i.e. give it another good kneading to0 make sure there are no huge air bubbles anywhere. Split the dough into 6 balls and shape them. Place them on a greased or lined baking tray. Fetch the shortcrust pastry from the fridge and roll it out to a few millimetres thick. Cut strips about 1cm wide and stick them to the top of each bun using a little water. Put the buns somewhere really warm to rise for another half hour while you preheat the oven to a very toasty 200 degrees centigrade. Bake the hot cross buns for 15 minutes (ours were a touch overcooked) and while they cook, make the glaze. Dissolve the sugar in the water in a small pan over a low heat until it forms a syrup. As soon as you take the buns out of the oven, paint the glaze over each bun to give them a shiny golden glow. Serve warm... ideally cut in half and toasted... with a knob of butter. Mmmmmm. i feel all easter-y just typing this up! Earlier this year, when I experienced my first ever Liz Earle facial, one of the things I was most impressed with was the range of superskin products that feature, as their primary scent, neroli oil. 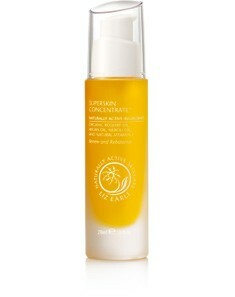 Since then, I have been using the Liz Earle Superskin Concentrate religiously. the Superskin Concentrate is a really heady blend of oils with an intense scent designed as a restorative supplement for dry skin or mature skin. You apply the facial oil after cleansing and toning but before your normal moisturiser. The oil is a combination of argan, avocado, rosehip, neroli, lavender, chamomile and hazelnut oils with vitamin E. Neroli is the primary contributor to the scent and it gives it a wonderful fruity smell that fills the whole room upon use. I enjoy the silky feeling that it gives my skin as I firmly rub it in, over my cheekbones and across my forehead and neck with my fingertips. I also find the warming sensation of the oil to be a great part of my pre-bedtime routine. The oil is designed to soften skin and I find that when I use it regularly with my other moisturisers, my skin has more plumpness when I wake in the morning. I REALLY enjoy using the Superskin Concentrate and can see this becoming one of life's little luxuries I'm prepared to slip into my regular routine. You can buy a little mini phial of the concentrate for just £5.50 or a roll-on for £19 but the larger 28ml bottle costs £38.75. This week I've started to waddle like a penguin! Bump is really beginning to grow now. Bending down is uncomfy and sitting anywhere for very long gives me backache. I'm not convinced that baby is in the right position - sometimes I think I can feel it moving in a full 360 degree turn and there was one evening this week where I'm pretty certain it was sitting transverse with feet poking out above my left hip and head poking out above my right. I have an appointment with the GP this week and he will be the one who decides whether baby needs moving. I've done a lot more exercise than normal this week - Mr B and I took a few days off work to start ticking off some of those things on my maternity to-do list! Mega-hot curry (check). Really nice meal out with just the two of us (check) and we also took Lara to Legoland which also counts as a (check). This week I sat down with Mr. B and, with the help of a print-out from the NHS choices website, we wrote up a birth plan. It was the first time that we had talked at length about Lara's birth and it was quite revealing to hear his thoughts about how the childbirth had gone. Mr. B. seems to have some strong opinions about where I (hmm, we?) went wrong last time so perhaps he might be a bit more assertive this time. Using my past experience, I've put in some decisions and some indicators for the midwife/midwives in charge at the time but in general I'm not going to approach things any differently this time around. We are going to try, once again, for a drug-free, water birth but just see where it takes us. Returning To Work After Maternity Leave - Benefits to part time work? After my surprisingly controversial Yahoo article a couple of weeks ago about the financial challenges of returning to work after maternity leave, I've been in contact with www.workingmums.co.uk who list part-time opportunities for mums looking for a flexible return to work. 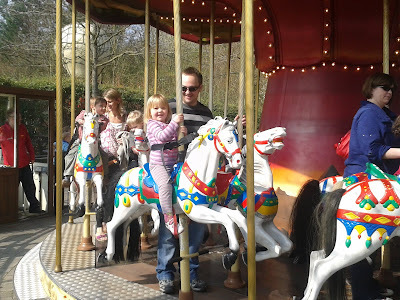 Below is a guest post from workingmums.co.uk that seemed particularly topical given my recent outburst! For many mums the most difficult decision after they have given birth is whether they are going back to work or not. For many it is not a choice - they simply cannot afford to stay at home but the guilt and difficulty in leaving their child is still there. That is why many mums return to work on a part time basis, but do the benefits of working part time outweigh the costs? Of course the main benefit of working part time is the fact you still get to spend time with your family. You know you are only in work for a short week so the guilt of leaving your child with family or a child minder is lessened and you also don’t have that nagging feeling that you are going to miss out on your child’s milestones such as their first steps or words. Part time work also means you are able to keep your career and be in a position to go for promotions and advance your work life. Many mums go back to work full time once their children are older so working part time while they are small helps with this transition and allows you to keep your skills up to date and your ‘hand in’ so to speak. There are of course many concerns for part time workers, the main one is some employers put pressure on their part time workers so they feel they have to put in the effort and hours of a full time position while getting half the salary. Many part time mums find themselves put in a lot of overtime. Because of this it is important to establish clear boundaries between your work and home life while still letting your employer know you want to be involved in any important decision that are taking place in the office. The cost of childcare is another issue faced by both full time and part time working mums. Often mums find the cost of childcare is more than they earn so it is important to consider this carefully before making decisions. If you would like any more information on part time work then you can visit www.workingmums.co.uk today. Now that Eaglemoss seem to have resolved the over-subscription issues they experienced when Dora's Little Cooks Collection was first released, we have received the next episodes of the magazine and some fab subscription freebies including a box-file for Lara to keep all of her copies in. In episode 2 Lara received a butterfly-shaped biscuit cutter. The main recipe in the magazine is for cheesy biscuits which really appealed to me but this weekend we decided to make Lara's Grandpa some sweet biscuit using Dora's butterfly biscuit cutter and the original recipe for inspiration. After all, that is one of the great things about teaching children to cook, introduce them to one new ingredient or a new way of cooking and it opens up a whole world of imagination and cookery possibilities. Once the flour is all added it will begin to form a soft dough. The dough is REALLY soft but not sticky. It is hard to work with but kids love it! Lara and I got a sneaky preview of a new children's cookbook - Peter Popple's Popcorn Cookbook which is released next month. Peter Popples is a young scientist who’s loves everything that goes pop, and the science behind it too. The cookbook is a small selection of 27 recipes that children can make with popcorn. Popcorn is a great snack for cooking with children as it is a wholegrain with a low GI that keeps energetic children full between meals. If you use a hot-air popcorn machine to pop the kernels, it is incredibly quick and safe to cook with children and can be an awful lot of fun. This was the first time that Lara had ever experienced popcorn - in the video below, I think she thought that singing might make the kernels pop more quickly! Most of the recipes in the Peter Popples Popcorn Cookbook are for sweet and sticky popcorn recipes (the more sweet and sticky you add, the less healthy the snack!). Towards the end there are some interesting ideas for savoury snacks - I chose Marmite Popcorn to cook with Lara because (a) she is a Marmite monster (b) it is dead simple to make and (c) the ingredients list came to a whopping 28p for enough popcorn to feed the mellow household all afternoon! To make the recipe you need 50g of popcorn kernels (you can buy these from most supermarkets in the aisle where you would find seeds and nuts). You will also ideally own a popcorn machine to pop the kernels; you can pop corn on the stove in a big pan (the cookbook explains how to do this) but it is definitely an adult job as it involves hot oil. Once the kernels are popped, melt a tablespoon of butter with a teaspoon of Marmite and stir the mixture into the corn, making sure the corn is lightly and evenly coated. Lara found the whole experience fascinating from start, to sticky finish and I even enjoyed the Marmite taste... I blame the pregnancy hormones! The next recipe Lara and I plan to cook from the cookbook is Blueberry Oat Popcorn Bars. I have been using Palmer's Cocoa Butter Formula Skin Therapy oil to prevent stretch marks since the start of my second trimester. When I reviewed it I mentioned that the scent was a little strong for me so instead I've been trying out the Palmers Tummy Butter for Stretch Marks which has a new formula. The Tummy Butter comes in a small, low tub and is a thick, buttery texture. You apply the butter to your bump (or, after the birth, where your bump used to be) to tackle stretch marks and there's nothing to stop you using it elsewhere on your body where stretch marks could appear. The Cocoa Butter Formula is the secret to tackling dry and stretched skin but in addition, this ultra-concentrated balm also includes Vitamin E, Collagen and Elastin to help maintain and restore firmness to the skin where you apply it. The best thing about the Tummy Butter for me is the scent. The butter is supplemented with soothing lavender oil which not only means it is nice and restful when I apply it in the evenings, but also means that the scent is a little lighter than other Palmers Cocoa Butter Formula products I've tried in the past - less cocoa-ey. 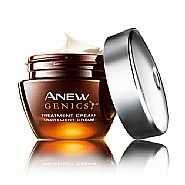 It is many many years since I've tried any Avon products so I was really interested to find out how things had changed when asked to review the Avon Anew Genics Treatment Cream. My first glance through the latest Avon campaign catalogue showed that the product range had grown much wider since I last came in contact with Avon during my late teens - it also seemed a lot more glamourous than I remembered with gorgeous sparkly images of Alesha Dixon sporting some Avon classics on the front cover. The Anew Genics range by Avon is a set of Anti-Ageing skincare products. My gut feeling is that they are targeted at a slightly older age range than me (judging by the age of the customers who comment on the product with some very positive reviews at the Avon shop) but I've always been a strong supporter of using anti-ageing products from your thirties onwards as a means of prevention, rather than cure (!) for the signs of ageing. The Anew Genics Treatment Cream is a very thick and luxurious moisturising cream available in a 30ml pot. The normal price is £23 but it is currently on special offer. The cream uses Avon's 'YouthGen' technology which contains ingredients that target dull skin, colour spots and wrinkles; it also claims to firm up the skin. My initial reaction to the product was that the texture was brilliant for a night cream - thick but not cloying. The scent is very strong and is not a natural fragrance - it reminds me of some of the fragrances Avon sell (you can try the fragrances on the scratch and sniff pages of the catalogue!) - once again I would think that the scent is targeted at the older lady. I have been using the Genics treatment cream at night for the past fortnight now and I would certainly agree with the claim that it improves the firmness of the skin, particularly around the tops of my cheekbones. I haven't yet seen any improvement in skintone and, thankfully, I don't yet have any wrinkles to reduce! This week I had another trip to the hospital for my second shot of Anti-D. Hopefully, the next time I go to hospital will be when baby arrives. The appointment took place with a midwife - this time a student midwife who was very inexperienced. It took two people to find the baby (!) but they finally established that the position is cephalic right now (head down, bottom up). I also had to have more bloods taken because the 28 week blood results had gone missing!!! the student midwife was freaked out by the fact that I have no visible blood supply and I am notoriously difficult to extract blood from. I was quite grateful that she wimped out and asked the phlebotomist to do it - me and needles don't get on at the best of times! This week my NCT class covered topics such as sibling rivalry, foetal positioning and relaxation techniques. In terms of foetal positioning, I know I've got some work to do to make sure baby is sitting on the ideal side when it comes to the big day and the fact that my job involves me sitting at a desk all day doesn't bode well for optimal foetal positioning. We have a rocking posture chair at work that I used a lot during my last pregnancy and yesterday I decided it was time to start using it again. I hope it works! 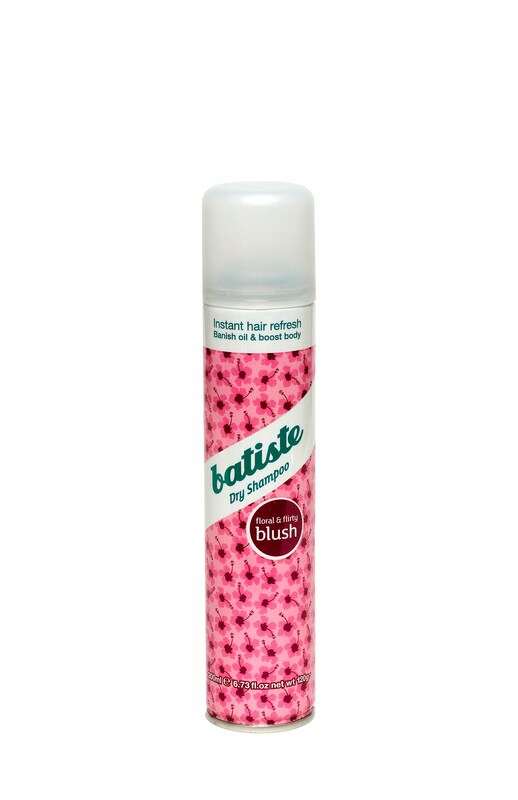 Dry Shampoo such as Batiste, or the slightly trendier Girlz Only, is not a new trend, it's just that I'm a bit slow to the party! Until I started reading other mummy's blogs, I'd never even heard of the concept of dry shampoo and until just before Christmas I had never tried it. I'd read a LOT of rave reviews about dry shampoo and once even saw a blog post on a beauty blog with literally hundreds of comments in support of Batiste dry shampoo so I figured I must be missing out and have now had the chance to experience the wonder myself! Dry shampoo is often touted (and regularly applauded) as a must-have product for new mums because it means you can spruce yourself up a bit in seconds without having to find the time for a full wash, blow dry and style. So, is dry shampoo REALLY every new mum's saviour? 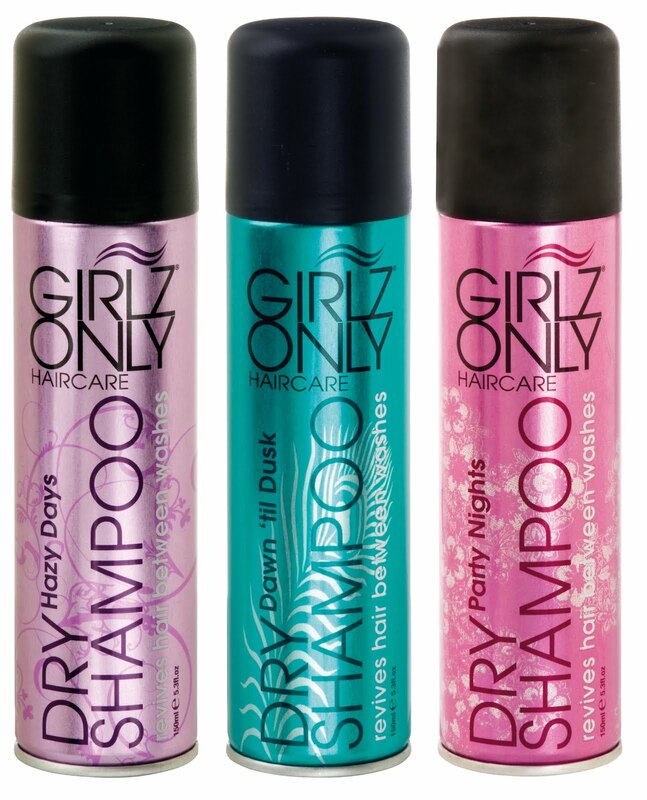 Dry shampoo comes in an aerosol can. You spray it onto your dry (obviously) hair around the roots and then massage it into your head to absorb some of the greasiness and bring a bit of life back. Dry shampoo doesn't clean your hair in the sense of the word I know and understand... it disguises the normal signs of dirty hair by absorbing the head's oils through an ever-so-slightly powdery deposit on the hair. In some cases, a dry shampoo will also act a little like a hair spray and offer volume and bounce to the hair. Both Batiste and Girlz Only come in a number of different scents to suit your mood or the event! 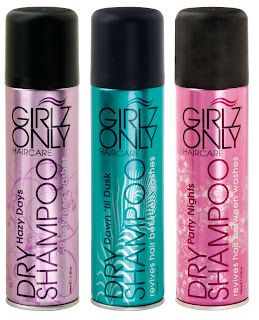 I really enjoyed the different scents of the Girlz Only range and found the smell alone to perk up a miserable day! The Batiste fragrance I tried was a little less noticeable but I found the 'cleaning' power of Batiste to be a lot more reliable. My ultimate challenge for dry shampoo will come in the days and weeks after birth when I can't face the bath or the the shower or baby simply won't let me escape to the bathroom. In the meantime, my current biggest challenge for the shampoo is on a Thursday afternoon when, having been swimming in a private pool with no shower facilities and no time to get home to wash my hair, I have to turn up at work in a presentable state by 2pm. I would say that Batiste just about manages to transform me from embarrassing wreck but even so, I'm still not brave enough to let my hair down at work. I remain to be convinced that dry shampoo is going to revolutionise my life as a new mum! One of the ways that I tried to stay mellow after childbirth the first time around was to fill the freezer full of healthy and nutritious meals that I had cooked in advance and which could be easily re-heated at any time of day or night. I intend to do much the same thing this time but I've learned an important lesson. When I was expecting Lara, I craved curry. Every day for 9 months the only thing I wanted to eat was spicy food (this isn't unusual for me even when I'm not pregnant but I like to think I have a more varied diet the rest of the time). For this reason, pretty much all of the meals that I batch cooked and put in the freezer for baby's arrival were curries and, as such, packed full of onions. Onions and newly breastfed babies don't mix very well and in the first few weeks of her life, Lara struggled a lot with wind. Once my Mum had pointed out the connection, it was easy to resolve. If you have any ideas for easy meals to cook at volume and which freeze well, please do leave them in the comments below. Perhaps you have a recipe on your own blog? or a link to a favourite recipe? All ideas welcome. Lara has laptop envy. She often wants to mimic what I do by playing on my laptop (although I think she understands that my work laptop is definitely out of bounds) so she was over the moon when asked to review the Peppa Pig 'My First Laptop' by Inspiration Works. OK, so it is a little more simplistic than my own laptop but it's a toy more than a learning aid so I think that's excusable! Lara likes to carry her 'puter' around by the handle and find herself a cosy spot to sit down and open it. When we received the Peppa Pig My First Laptop I had low expectations. I was quite happy for it to turn out to be purely a toy with nothing but a vague attempt at being 'educational'; after all, some of Lara's favourite toys are ones that simply make a lot of noise (most of these are, it seems, Peppa Pig themed!) However, I have been pleasantly surprised at how much Lara does learn from the toy, how it really does make her think about numbers and letters. The My First Laptop is suitable for children from age 2 to 5. It has four different play modes suit different abilities (and moods). The laptop opens up to reveal a brightly coloured screen and a number of differently coloured buttons that correspond to Peppa's friends, letters, numbers and musical instruments. The first game mode is an exploratory one for younger children where they press buttons to find out what they each mean. The next two levels are quiz modes where the laptop asks your child a question about what they can see on the screen and they have to respond by pressing the correct button. The second quiz mode is a little beyond Lara right now but it means she has plenty more usage to make of this toy. The final mode is a music mode (perhaps Lara's favourite) where you can press buttons willy nilly to make sweet, sweet music (errrrr.......). I really think the quiz modes work well. Lara is slowly getting on top of her basic counting skills but has a long way to go when it comes to letters and word noises so I think this will make a great way for her to start learning. The number of options is limited though so I'm worried that, given time, it will be more of an exercise in memory and repetition than in genuine learning. The Peppa Pig My First Laptop has a RRP of £19.99 and is available at Amazon, Mothercare, John Lewis, The Entertainer and Morrisons. This week I went to my first NCT lesson of this pregnancy. I had been in two minds about whether to fork out the money for the NCT refresher course but I decided to do it for two reasons. My first childbirth experience ended in a drug-induced haze so the whole experience is a bit blurry so I think I could do with a refresher. Our first lesson was a bit more like a therapy session than a lesson. We all shared our birth stories and it was pretty emotional. Not a single woman in the room had experienced an uncomplicated birth (I don't think NCT prepared me last time for quite how likely it was that I 'would' experience an intervention birth). It was good to get some of my worries off my chest and I also managed to get hold of a hypnobirthing CD so I shall give that a try. In other news, I went into London on a day off work and had some pictures taken for a new venture of mine. I think they may well be the only photos of a pregnant me this time around so I am looking forward to seeing them. I'm glad I don't have to do a commute in and out of Central London these days - wouldn't be much fun with a bump. According to my ipod app, I should have my birth plan written and my bags packed just about now... just in case of early onset labour. I haven't but now is as good a time as any to start thinking about what I need. My memories of my time in hospital (including a day and a half after the birth) is all a bit of a blur so its hard for me to remember what I found useful and what I didn't bother using. I can't even remember whether there was anything I really felt I was lacking and then wished I had taken with me. Mr. B's memory is just as blurry. A sponge scourer for cleaning the bath - shared hospital baths can have some hidden surprises (cobwbebs in my case)! This weekend Lara and I had some time to ourselves so we got ourselves in the mood for spring by baking some chocolate cupcakes and decorating them with flowers, sparkles and general loveliness (all supplied to us by Dr. Oetker) - these would make a great mother's day gift or easter surprise for someone. Preheat the oven to about 170 centigrade. Add in the sugar, margarine and egg and beat well to form a thick, smooth batter. Split the mixture evenly into cupcake cases and bake in the oven for about 12-18 minutes. Allow the cakes to cool fully on a cooling rack before even thinking about starting to ice them! To make the icing, beat the butter until it is soft and fluffy and then slowly add in the icing sugar. Add in the vanilla essence, milk and about 4 or 5 drops of food colouring, enough to give the icing the colour of easter chicks! Pipe (or splodge) the icing onto the cakes and then decorate with wafer flowers, silver balls and mini marshmallows before giving them a spray with edible shimmer spray and leaving the icing to set. Last week I noticed about three conversations in my facebook timeline from real people (not these funny virtual people like bloggers, you know) talking about taking their children to the theatre. It dawned on me that I've never done anything like that with Lara... perhaps I should? Then I thought again. Lara is two and a half... and wiggly. Lara can't sit still for more than 20 seconds. How would I ever take her to the theatre? Surely we'd end up leaving after 20 seconds and totally wasting our money? Or perhaps she would be enthralled and surprise me by staying glued to her seat? It seems like an expensive gamble to me. 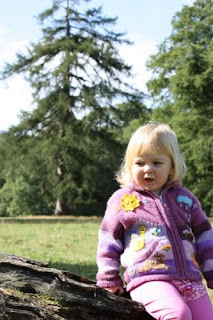 Last summer, at around the time of her second birthday, we took Lara to the cinema to watch Winnie the Pooh. Although she did enjoy most of it, I think she found the drama of the big screen a bit overwhelming and she screamed through much of the movie and insisted on sitting on my lap. Watching the same film at home, she is a lot more relaxed (mind you, she won't sit on the sofa watching it and prefers to walk around the room and dance during the movie). Before Lara came into our lives, we quite regularly used to see plays in London; in fact, we watched two in the run up to her birth (and the bump freaked out at Blood Brothers) because we knew it could be a while before we went again. And so, every time my monthly copy of my Mum's comping magazine drops through my letterbox, I read through and see really tempting competitions for fun sounding things like Lion King Tickets and then make the decision not to enter because I just can't picture it working. (Now I've written that it sounds silly because if there was ever a cheap way to make the 'should-I-take-Lara-to-the-theatre gamble', it would be to win the tickets). What do you think? Am I being totally unmellow? Should I try taking Lara to see the Lion King? or the Gruffalo? or Peppa Pig or even Hairy Maclary on stage? Should my 2 year old be more cultured? As you may know, I am a bit of a baby wipe snob. I am also someone who would always choose the environmentally friendly option, if it were as effective as other options which is why we have been reviewing some of the baby change products from the Earth Friendly Baby range. When Lara was first born Earth Friendly Baby was one of the very first brands of baby wipe that we tried. I'll admit that I had totally forgotten that we had tried them but as soon as the packet of baby wipes arrived to review, I recognised the packaging. 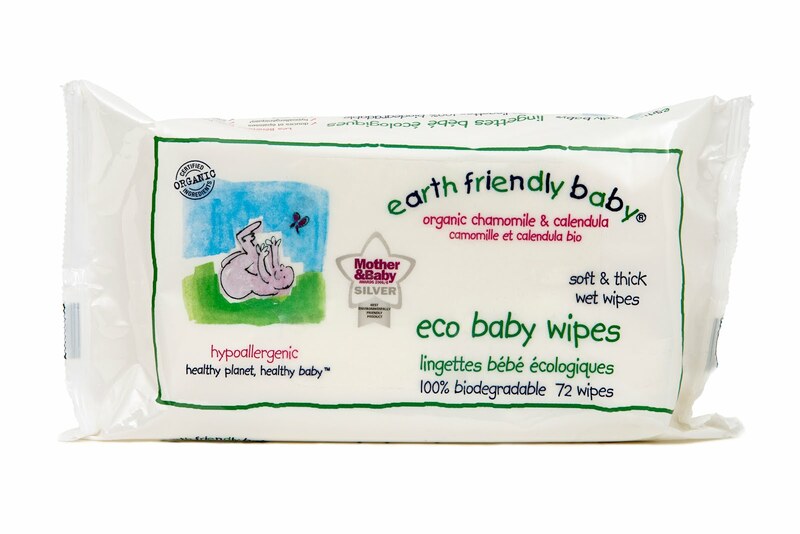 I was delighted to find that the scent of the Earth Friendly Baby eco baby wipes had improved since we first try them back in spring 2009 - the interesting fact here is that they are actually unfragranced, which means that you are at the mercy of the smell of the ingredients that the wipes contain. It seems that now the soft, floral smell of natural chamomile and calendula is strong enough to fight off the slightly raw, plant smell of aloe vera. All of the plant-based ingredients in the Earth Friendly Baby eco baby wipes are organic in origin and the wipes are 100% biodegradable which for me is the single most important aspect of a baby wipe, given the volume of them we use with our babies in the UK. The strength and texture of the wipes is good, better than the supermarket own degradable wipes that I use. 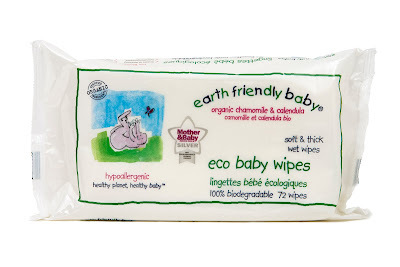 There are 72 wipes in a pack which makes the Earth Friendly Baby wipes a real competitor when it comes to value for money. My only negative comment is that I found the pack hard to open and because I had to yank the packet open at first, this made it tricky to reseal properly in the future. I have found the wipes to be effective and kind to Lara's skin and I'd be happy to use them on the new baby when they get a little older. The Earth Friendly Baby nappy sacks to me don't look any different to any supermarket branded nappy sack available. The material doesn't feel any different, size and number is no different (you get 50 to a roll) and the perforations between bags are no different. I found the bags hard to tear off the role, but then I found that with other brands too!. The only difference, as far as I can see is that the Earth Friendly Baby nappy sacks are 100% biodegradable, whereas many supermarket own brands ones are not. The nappy sacks have tie handles and are unfragranced. Simple and useful to have in your changing bag for when out and about so that you can take all your mess away in one go. Earth Friendly Baby wipes can be bought in some supermarkets including Waitrose and John Lewis, larger Mothercare stores and in numerous online baby boutiques. 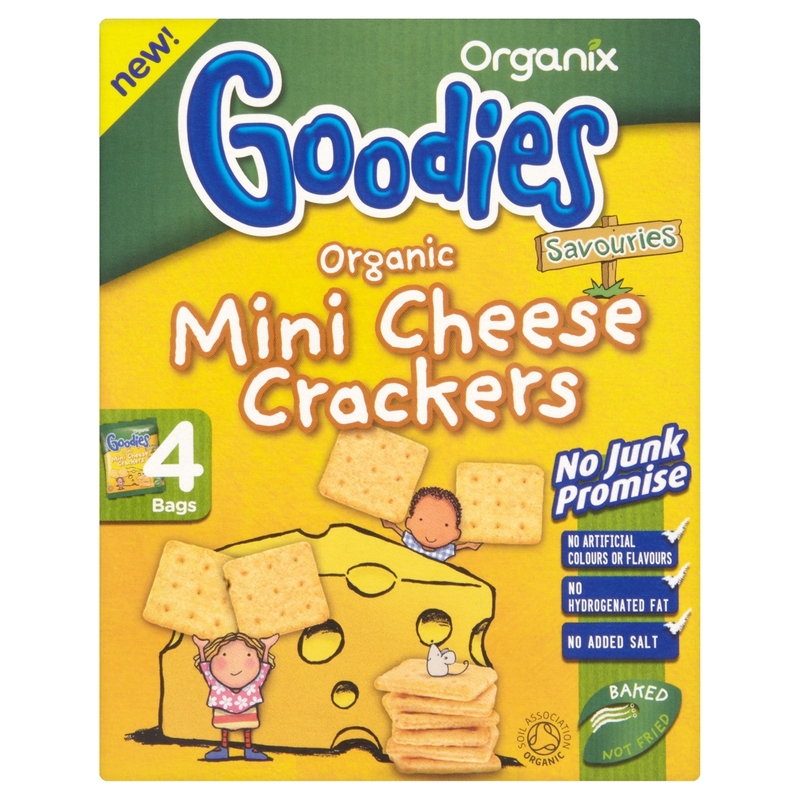 You can follow Earth Friendly Baby on facebook for details of offers and competitons. I KNEW that a pair of Hello Kitty Crocs™ boots would go down a storm with Lara. It feels weird to sit here at thirty-something years old knowing that I was just as fascinated by Hello Kitty as a child as she is! Lara has tried to insist that she wears her new wellies on every occasion that we leave the house. In the garden, to the park, in the supermarket. Whether it is rainy, snowy or sunny Lara is in love with her Crocs™. And I don't blame her - I quite fancy a pair myself! The most remarkable thing about the boots is the reaction they get from other mums; I suspect I am not the only mum who fancies a pair of Hello Kitty boots judging by the number of envious comments I get from mums in the park! Lara's boots are part of the latest range of boots for girls and boys by Crocs™. 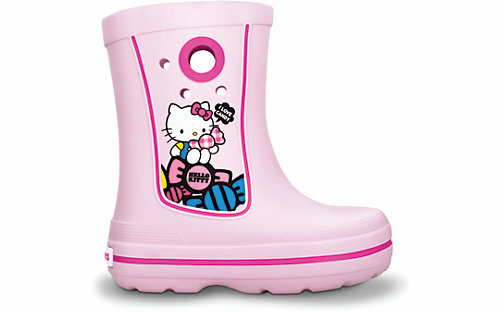 They are Crocs™ Crocband™ Hello Kitty Jaunt Boots which are also available in yellow and red. The boots are really light weight and made from a similar material as traditional Crocs™ clogs. Because they are so light, I don't really have a problem with Lara wearing them even when it's not rainy. The boots have a big hole on both sides that allow Lara to pull her boots on all by herself. They also have three of the traditional little Crocs™ holes into which you can put Jibbitz shoe charms - I'm sure that slightly older girls would absolutely LOVE this, but I think they're a little bit small and fiddly for a 2 year old. The Crocs™ Crocband™ Hello Kitty Jaunt boots cost around £29.99 and are available in children's size 6 upwards. This week the baby has become incredibly active. When I am sitting in meetings at work, other people can see my belly wiggling and jiggling! Before Lara was born she always used to have an active time of night at about 10pm and a small kick just before or after my lunch. This baby is different... it is active ALL day. No really, I never ever get a moment when I'm not aware of it doing its thing. Not even if I wake up at 3am to go to the toilet. This is an ominous sign for when baby arrives. Someone asked me this week whether I had been experiencing 'baby brain' and I'm delighted to say "No". For a couple of weeks between my first and second trimester I struggled to remember anything (even spelling simple words) for more than 20 seconds but since then I haven't felt it at all during this pregnancy. Phew. This week represents a major milestone, financially. Why? Because Mr. B. and I successfully managed to get our mortgage down to the next LTV (Loan to Value) rate which means that we save ourselves nearly £300 a month in mortgage costs. This was a big goal for us to complete before I go on maternity leave. That extra £300 each month will mean that I can afford to take a little longer as maternity leave and by making regular overpayments over the past 6 months we've reached out goal. In addition to this we have swapped our electricity and gas contracts (another noticeable monthly saving) and streamlined our grocery shopping. Every little helps!